QS Disclaimer is a system for adding legal disclaimers and signatures to all e-mail messages from a Microsoft Windows Server with Exchange or IIS, giving your company a professional and legally compliant feel. Disclaimers are a useful feature that can ensure communications from your company in electronic format are acknowledged to be confidential and are susceptible to corruption, interception and unauthorised amendment. A legal disclaimer allows you to remove any liability for electronic mail that could have been modified. QS Disclaimer can also be used to inform the recipient that you are monitoring e-mail and its content, this stops any uncertainty over communications between you and the recipient. In addition, QS Disclaimer can be used as a banner or signature to promote your company in every e-mail you send (providing you with free advertising). Using a disclaimer will decrease your legal liability, ensure that you have regulatory compliance, help to stop confidentiality breaches, avoid damage to your reputation and improve your professional image (click here for more information). With QS Disclaimer you can centrally control the whole process of e-mail disclaiming and ensure all users are complying with company protocols without the need to work at a user level. QS Disclaimer can add disclaimers to mail sent from any client, such as; Outlook, Outlook Express, Outlook Web Access, Apple Mail or even handheld devices and Smart Phones such as a Blackberry, as long as the message is sent via Exchange or the SMTP Server. The manager is the interface where you control the configuration and settings of the disclaimer engine. It is also used to start, stop or pause the service, change disclaimers and add or remove domains. The manager is implemented as a MMC snap-in so that it can be easily integrated. To get the most out of QS Disclaimer and provide a good working environment for your mail system, you can adjust the settings, creating a simple and easy to use disclaimer system. You can choose from plain text or HTML. The Text/Plain media type is the lowest common denominator of Internet email, with lines of no more than 997 characters (by convention usually no more than 80), and where the CRLF sequence represents a line break. HTML has been in use in the World Wide Web information infrastructure since 1990. The text/html media type defines HTML version 2 onwards. 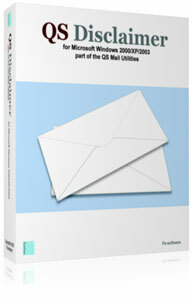 As e-mail clients can use any format of mail e.g. plain text, HTML, RTF or enriched, QS Disclaimer will automatically choose the correct disclaimer for the format of mail that is being sent. When using a HTML disclaimer, you can use linked images for your company logo which will reduce the e-mail size and complexity for both you and your recipient (click here for an example). Or you can embed the image to ensure the recipient receives the image as some clients block internet images. Messages can optionally be excluded from a disclaimer if a user, recipient or recipient domain(s). This is useful when sending messages to certain recipients or for when certain users want more control over the disclaimer or signature used. The ability to add disclaimers to internal mail as well as outbound mail, Active Directory group disclaimers, e-mail archiving and Active Directory/mail elements. QS Disclaimer comes with a simple and easy to use disclaimer editor to edit and design all your disclaimers and signatures in either HTML or plain text. As messages are passed through the disclaimer engine, they are searched for an existing disclaimer, if found the previous disclaimer is removed before the new disclaimer is added (this ensures that the latest and up to date disclaimer is always added to the bottom of the e-mail). For example: If you reply to a message from a recipient that you originally sent, the previous disclaimer will be removed and a new one added. As QS Disclaimer uses a domain and server license structure, the amount of users that can use the system is unlimited, allowing companies to add new users without the fear of more huge license fees. Images can be used as either links to an external web site or directly embedded into the HTML message. Disclaimers can be created for both plain text and HTML. Plain text disclaimers can also be used for HTML mail as well as both rich text (RTF) and enriched messages. Disclaimer can also be added in different positions, either top, top and signature, top and bottom, signature and bottom. With HTML disclaimers, it is possible to have non-intrusive disclaimers and even messages to help stop the printing of messages. QS Disclaimer uses a multithreaded processing engine for excellent and even performance no matter the message size. The disclaimer manager is implemented as a Microsoft Management Console (MMC) Snap-In, and provides system administrators and advanced users with a flexible interface through which they may configure and monitor the system. From the manager disclaimers can be created, removed and edited. Also, from the manager configuration data can be imported and exported for easy backup and migration. QS Disclaimer can be set to ignore internal mail if only external disclaimers are required. Works with multiple virtual SMTP servers. Includes support for statistical analysis. Uses the event log for status messages. With QS Disclaimer you can add different disclaimers for internal mail as well as external and the mail is only considered external if you do not have the domain listed. This means that mail to other departments in different countries are not forced to receive the disclaimer used for external mail. QS Disclaimer includes the ability to insert fields, including any field from the Active Directory into any disclaimer. This enables disclaimers to become dynamic and can allow the disclaimers and signatures to include information based on the user that is sending the message e.g. adding the fields [Display Name], [Company], [Telephone] and [Home page]. When QS Disclaimer adds the disclaimer to the message and user fields are used, Active Directory will be searched for the user details and the fields in the disclaimer will be replaced with the results. Disclaimer based groups can be created using either Active Directory or a comma separated e-mail list. This allows groups of senders to use different disclaimers e.g. using a sales disclaimer for the sales team. This feature allows you to save each e-mail into an archive folder as full source (not TNEF) with or without the appended disclaimer. There is also the option to send a copy of each e-mail to another mailbox. In a multi-server environment you may find maintaining configuration data on all the servers inconvenient. The clustering option allows you to configure your settings on a host computer and then deploy them to each server in your organisation. Clusters can be either true cluster nodes or multiple servers that will be using the same configuration data. With remote management you can manage the server from another server or any workstation that is part of the domain. The nodes of a cluster or multiple servers can be managed remotely using one of the nodes or servers or a workstation that is part of the domain. Unlimited users for each domain. Can be set to use plain text, enriched and HTML disclaimers. Can use the plain text disclaimer for RTF, enriched and HTML mail. External and internal mail supported. Manager is implemented as an MMC Snap-In. Active Directory, mail and server fields. QS Disclaimer can run in a number of configurations and environments, including on a Windows 2000, 2003, 2008, 2102 and 2106 server with Exchange 2000/2003/2007/2010/2013/2016 or on a Windows server with just IIS SMTP installed. Microsoft Windows Server 2000 (all versions), Windows Server 2003 x86 (all versions) and Windows Server 2008 x86 (all versions). Microsoft Windows Server 2003 x64 (all versions), Windows Server 2003 R2 x64 (all versions), Windows Server 2008 x64 (all versions), Windows Server 2012 x64 (all versions including R2) and Windows Server 2016 x64. Microsoft Windows Server 2000 (all versions), Windows Server 2003 x86 and x64 (all versions) and Windows Server 2008 x86 and x64 (all versions). Note: In a multi-server or clustered environment, QS Disclaimer can be remotely maintained from a Windows 2000, XP, Vista, 7, 8, 8.1, and 10 workstation or another Windows server. Intel Extended Memory 64 Technology (Intel EM64T) or AMD processor that supports the AMD64 platform. Intel Itanium family IA64 processors are not supported. QS Disclaimer can be installed on a computer running Microsoft Exchange 2000 or newer, in this case the deployment of QS Disclaimer must be on the	MXS servers which handle internet mail delivery (i.e. the machines that are configured as bridgehead servers for the SMTP connectors) or the Transport Hub and mailbox servers for Exchange 2007 onwards. For internal disclaimers, QS Disclaimer must be installed on all the servers that handle mail delivery. QS Disclaimer can be fully uninstalled with the original installer or using 'Add or remove programs' or 'Uninstall a program' from the Windows control panel. The settings created can also be removed	when uninstalling. Please note that the IIS SMTP service for Exchange 2003 or the Exchange Transport service for Exchange 2007 or newer, will need to be restarted by the uninstaller. * Added a group based option to send a copy to the sender. * Fixed an issue with groups under Windows 2016. * Fixed an issue when using the option to convert plain text to HTML. * Fixed an issue where a UTF-8 plain text body would be converted to ANSI even if it had Unicode characters. * Fixed an issue installing under Exchange 2016. * Fixed a problem with UTF-8 HTML in the editor. * Added support for find and replace in the editor. * Added the option to copy images when using the remote manager. * Added a disclaimer wizard. * Added example disclaimer and signature templates. * Added the option to edit disclaimers and signatures from a web browser. * Added conditional expressions e.g. if a user name exists in AD, show the name. * Added the option to convert mail from plain text to HTML based on having a disclaimer/signature added. * Added the ability to bifurcate mail under Exchange 2007 or newer. * Fixed an issue updating the mail server status. * Fixed a permissions issue with non-English Windows installations. * Fixed an issue installing under Exchange 2013. * Fixed an Exchange 2013 SP1 GAC issue. * Fixed a service log issue. * Added scheduling for groups. * Fixed a separator issue for signatures and added defaults for Android devices. * Fixed a service installation issue. * Fixed issues with blank pages in the HTML editor. * Added an internal has priority setting. * Fixed a nested groups issue. * An improved engine for Exchange 2003. * Added priority and sensitivity based disclaimer. * Improvements in the disclaimer manager, including the engine status as a Mail Server image. * Fixed an issue with Outlook 2007/2010 and TNEF character sets. * Improvements in the embedding of images. * Added support for top, bottom and signature disclaimers all together. * Now includes an option to turn plain text into HTML. * Improvements in the disclaimer editor. * Fixed some installer issues. * Added CC and BCC sections to saved mail details (now logs all mail). * Added the option to set the default disclaimer to none so that the groups can control all disclaimers. * Fixed an issue with extremely long HTML lines and signatures. * Fixed an Active Directory timing issue. * Added extra exception logging. * Fixed an issue when logging mail processed. * Fixed a signature positioning issue with iPhone replies. * Fixed an image naming issue when using multiple images. * Added checks for signed and encrypted messages (which are now ignored). * Added protection for incorrect shutdowns. * Added a check for invalid message content. department if you require any assistance or clarification on prices. For Windows 2000, XP, 2003, 2003 SBS, Vista, 2008, 7, 2011 SBS, 8, 8.1, 2012, 10 and 2016. (Version 4.6.17). This download is for a fully featured trial which will only function for 30 days before a license needs to be added. This product is supplied with an installer and wizard to easily set up and start the system without any need to reboot the server or have any down time for the mail server. The installer can also be used to fully uninstall the product. The product can also be removed using 'Add or remove programs' or 'Uninstall a program' from the Windows control panel. "Works flawlessly with our volume of mail (over 5000 mailboxes)"
"Very easy to install and set up. It was up and running within approx 10 minutes"
"Not having to license each user has saved us a fortune."